…that in the 1890s Clark Coe created an attraction of life-sized moving figures called the Killingworth Images on his farm on Green Hill Road. The Killingworth Images were in place on the Killingworth site until the early 1920s. Clark Coe died in 1919. Today, his work is held in the collections of the American Folk Art Museum in New York City and the Smithsonian American Art Museum in Washington, DC. “Clark Coe.” American Folk Art Museum, 2014. Link. 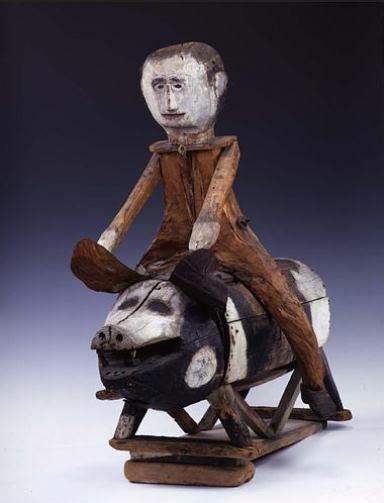 “Killingworth Image, Man on a Hog by Clark Coe.” Smithsonian American Art Museum, 2014. Link. “Killingworth Historical Society,” 2012. Link.